Scammers are creating independent seller accounts on Amazon to lure in victims, offer unbeatable deals, and make off with buyers’ money. These fraudulent merchants purposefully fail to fulfill an order for a product listed on Amazon. When emailed for assistance, they then request the buyer to complete the purchase outside of the Amazon system in a convincing phishing attempt. Victims who comply never receive their product, and Amazon offers little recourse for a refund. Requesting payment outside of Amazon’s shopping cart is strictly prohibited, and no legitimate seller would suggest it. Amazon has an in-house merchant-to-customer messaging system. Never engage with a seller who attempts to correspond through email or other means. Never buy a product on Amazon that requires payment outside of the official Amazon website or app. Comparitech investigated one such merchant in particular, ScElegance, which primarily sells expensive electronics such as televisions and cameras. 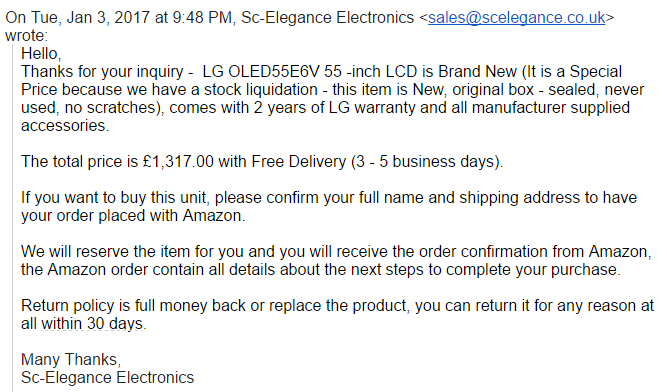 We attempted to purchase a 55-inch LG OLED TV that normally retails for over £2,200 on Amazon’s UK site. ScElegance advertised the same TV in “Used – Like New” condition for a mere £1,318. Amazon recommends changing the delivery address or seeing if the item is available from another seller. Because ScElegance sells the TV at the lowest price by a wide margin, that’s not likely to happen. On the product listing, ScElegance lists an email for delivery and order details. If contacted through Amazon’s in-house messaging system, the company will direct you to the same email. We contacted ScElegance via email to ask why the TV was so cheap, whether there was anything wrong with it, and if it comes with a guarantee. The response? The TV is brand new, but at a “Special Price” due to stock liquidation. 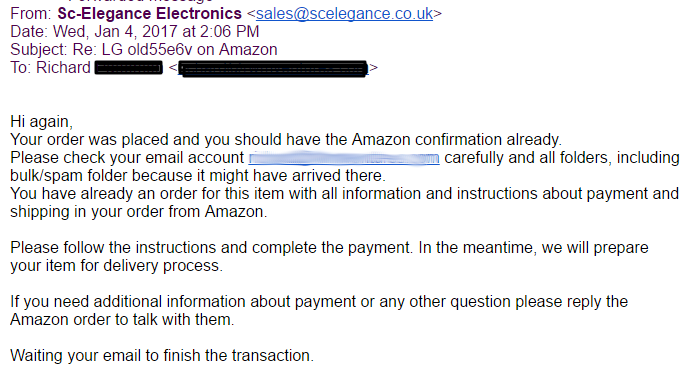 What followed was a series of emails with the ScElegance sales team, ending with a rather convincing email from a fake Amazon payments account. 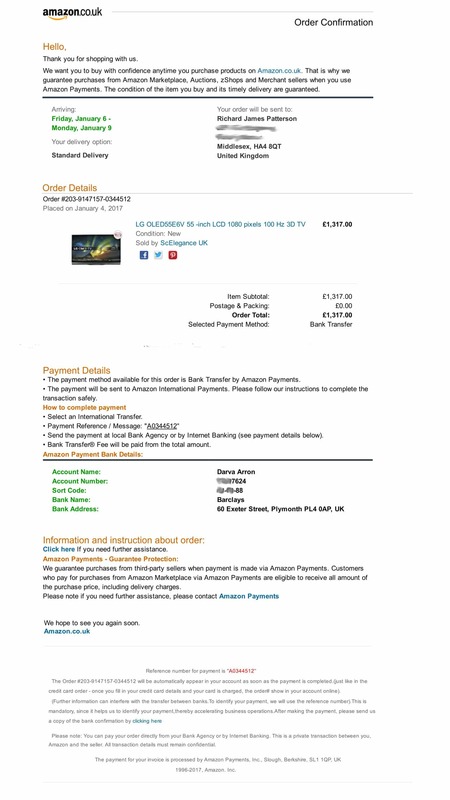 The final invoice appears to be from Amazon, but in fact uses a fraudulent email address, “auto-confirm@amazon-payments-support.co.uk”, and an substitutes Amazon’s real email address as the username: “auto-confirm@amazon.co.uk”. The email requests a direct bank transfer to an individual named Darva Arron. ScElegance UK used a fresh seller account with the “Just Launched” status. Despite having no seller feedback, the products themselves have multiple positive reviews left by customers who purchased identical items from legitimate sellers. This isn’t the first time such a scam has been reported. We found complaints about fraudulent merchants–ScElegance in particular–dating back to November 15, 2016 on Amazon’s own forums. We’ve contacted Amazon to ask how and why this behavior was allowed to continue for so long. We will update this article with their response if and when we receive it. Update on January 5 @14:00 (GMT+0): See Amazon’s statement below. Since we contacted Amazon, the seller account still exists, but its products are no longer for sale. Notably, Amazon only shut the account down after we pointed out the scam and provided them with all of the evidence published in this post despite customers publicly complaining two months ago. Other users reported legitimate seller accounts being hacked and used to employ the same scam. If true, these accounts would already have positive feedback ratings and appear to be even more trustworthy. In another version of the same scam, victims were told to buy (worthless) gift cards in lieu of a bank transfer. We’ve seen Amazon-related email scams in the past, but these fraudsters have been so bold as to successfully use real merchant accounts on Amazon. Early January is a popular time of year for shoppers in the UK to find bargains, similar to Black Friday and Cyber Monday in the United States. This makes scams more believable, but remember the golden rule: If it sounds too good to be true, it probably is. This Scam is still very much active, but now hey do it through a hacked amazon account. the payment, Order confirmation even the “Dispatch Confirmation” all come through the Amazon official website. Reported it 4 times to Amazon, but the scam is still happening on a daily basis. 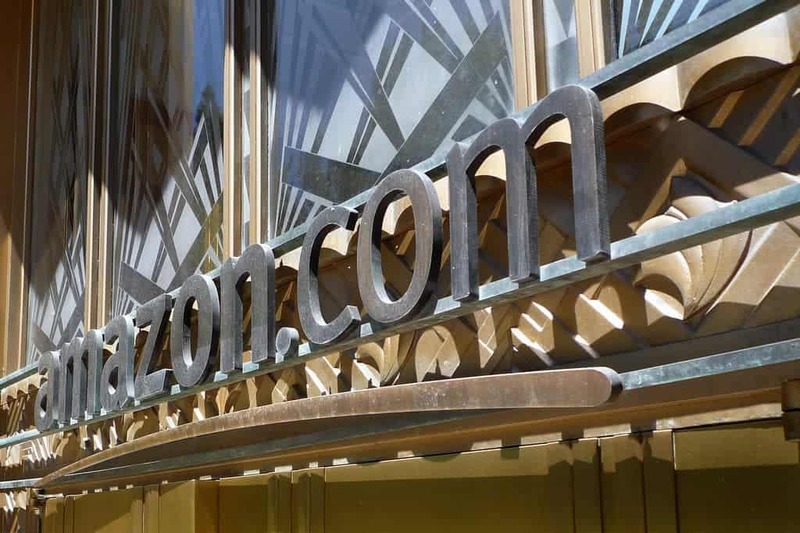 It does not add confidence to the Amazon experience and damages their reputation. Look for LG OLED55E6V 55-inch OLED 4K 3D TV and be aware for the scams!! A small number of Amazon customers have been working hard to expose these scams Amazon are usually very tardy in taking action even when reported. Amazon used to have a general help forum where these scams were publicised but they removed the forum so it is difficult to warn Amazon customers. The reporting was continued on this site but it is very frustrating that Amazon take little action when it would be so easy for them to stop it. I too was almost caught by an Amazon recommended company called Ebuy2016 that claimed to sell hard drives at a substantial saving. As I receive a spoof email from them or similar companies every day I have now closed my account on these emails.